Apollo 15 Command and Service Module in lunar orbit (Credits: NASA). During the Moon race, North American Aviation (NAA) engineers presented to NASA a preliminary study on a possible one-man rescue mission for Apollo astronauts stuck in lunar orbit. 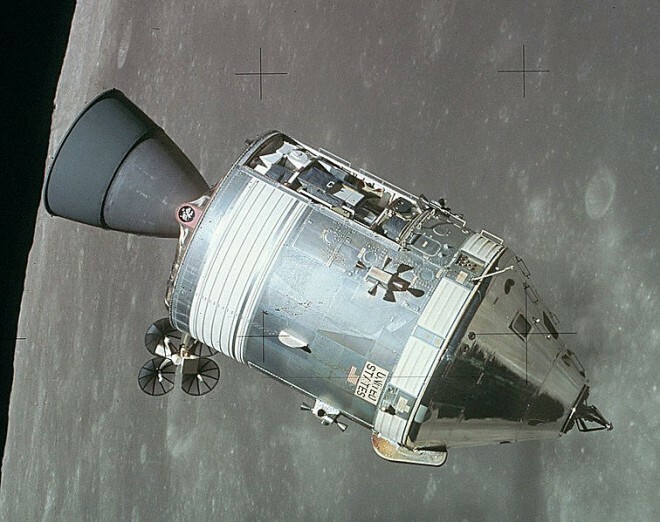 The rescue mission would have used a modified version of the Apollo Command and Service Module (CSM), developed by NAA itself as prime contractor for the project. The CSM would be modified to carry a special docking unit on the nose, configurable as an active probe or drogue. As a probe, it would have been used on the Apollo Lunar Excursions Module (LEM), while as a drogue, it would have worked on the passive docking device of a standard CSM. Since the status of the lunar mission requiring rescue could have been unknown from Earth, the engineers gave the rescue astronaut the ability to change configuration in flight. Moreover, the astronaut would have been provided with a tether, a life support extension, a compressed gas-propelled device, and protective meteoroid clothing, in case the mission required a spacewalk. That is also why the CSM would carry an inflatable “handrail” to help astronauts to traverse the distance between the two spacecraft once they were close. The total mass addition to the rescue CSM would total 200 kg (445 lb), partially balanced by the absence of 188 kg (415 lb) of science equipment not needed in a rescue. Vehicle Assembly Building at KSC, where the rescue Saturn V and CSM would have been stored according to a NAA project (Credits: NASA). 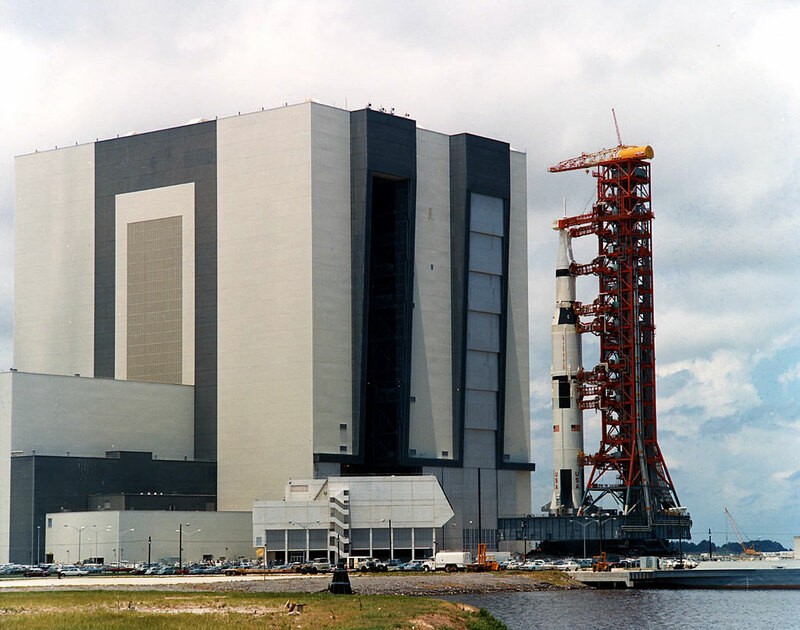 NAA’s intent was to have the rescue CSM stand during every Apollo lunar mission on the top of a Saturn V rocket on one of the launch pads at Kennedy Space Center, Florida. The rocket would be identical to the one used for the lunar mission except for not carrying the LEM. In case of successful mission, the rescue CSM along with the Saturn V would be rolled back to the Vehicle Assembly Building for storage until the next Apollo lunar mission. A single modified CSM could stand up to three lunar missions and then it would need to be replaced. NAA obviously considered the worst case: a rescue CSM launched as soon as NASA would get word of critical problems in the Apollo mission. In such a case, the CSM would be launched without preloaded calculations to match orbits and rendezvous with the stranded spacecraft. Therefore the astronaut on the rescue CMS would need to be able to use the propulsion system main engine “manually” to achieve an orbit close to the stranded spacecraft. However, launching immediately could create even more complications like increasing duration of the rescue mission and of course, putting even more astronauts in danger. The development of this safety module would have cost NASA a total of $86 million. NAA engineers did not discuss how astronauts, stuck in a small module, could survive with a limited supply of consumables like breathable oxygen and lithium hydroxide for removing carbon dioxide. Another important issue was the possible danger involved in keeping the rescue CSM and a fully loaded Saturn V on standby at the launch pad for the entire duration of the mission. Considering these technical difficulties and the cost, NASA in the end chose to not go for a rescue mission in lunar orbit. A scenario like the one pictured by NAA engineers happened during the Apollo 13 mission, but thanks to the flight control team the mission didn’t end up in tragedy. However, the feasibility and development of a possible rescue mission may again be an important topic of discussion while designing future planetary missions. Reference: 4-Man Apollo Rescue Mission, AS65-36, M. W. Jack Bell, et al, North American Aviation, November 1965; presentation at NASA Headquarters, 13 December 1965.